Think Before You Pink » What the Cluck?! We started Think Before You Pink to pull back the curtain on the surge in pink cause marketing. 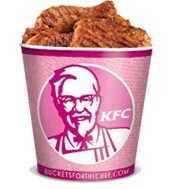 We were deeply concerned about the implications of KFC’s and Komen for the Cure’s 2010 “Buckets for the Cure” campaign. After sending our first letter to express concern about this partnership, we received a form response from Margo Lucero, Director of Corporate Relations at Susan G. Komen for the Cure. We say: Komen and KFC have targeted underserved communities whose residents often struggle to stretch their food dollars and are dependent on cheap meals. If you want to serve underserved communities, work with the community health clinics, economic development corporations, and community coalitions that are working to reverse the damage KFC and others have done. KFC and other fast food restaurants are disproportionately located in low-income communities (especially those of color) for very specific reasons. Low-income neighborhoods are underserved by grocery stores with healthier options, and therefore are “prime real estate” for fast food restaurants that provide inexpensive, already prepared options. Faced with a lack of options, these already vulnerable communities are prey to large companies like KFC that offer the least amount of nutrition for the most profit. Read PolicyLink’s report, “The Grocery Gap: Who Has Access to Healthy Food and Why It Matters” for more information about this unfortunate phenomenon. By placing the responsibility for our crisis in diet on the consumer, they reveal a disturbing lack of insight and understanding related to social inequities in this country. This is shameful. In addition, the claim that the partnership focuses on healthy options is outrageous. A menu with one or two salads does not a “focus” make! And it is equally outrageous that they claim to be educating people to make healthy food choices by encouraging them to eat at a fried chicken franchise. KFC is currently embroiled in a suit related to their chicken’s high levels of PhIP, a byproduct of the grilling process listed on the state of California’s list of carcinogens. While there is much that isn’t known about PhIP- Komen’s representative acknowledged that the NCI has not established safe or unsafe levels for its consumption – it seems both ridiculous and unethical to frame the breast cancer epidemic as something “curable” through repeated consumption of these ingredients. In terms of prevention, we cannot imagine feeding people carcinogenic grilled chicken that raises the risk of heart disease and breast cancer and then expecting them not to become sick. Corporate Benevolence – tastes like chicken? Make no mistake – every pink bucket purchase will do more to benefit KFC’s bottom line than it will to cure breast cancer. The Buckets for the Cure website, cast in a particularly sickening shade of pink, noted that “customer purchases of KFC buckets during the promotion will not directly increase the total contribution”. In small print, of course. They say that 50 cents from each bucket purchased will go to Susan G. Komen for the Cure, but exactly how much does KFC stand to gain from this campaign? Is it more or less than the $8.5 million that is the fundraising goal for Komen? KFC, owned by the world’s largest restaurant company, could surely afford to donate the $8.5 million independently of the Buckets for the Cure promotion. Instead, they have decided to use this opportunity to improve their brand and drive up sales of their products. Raising money in the name of breast cancer research, while engaged in a partnership with a corporation that may very well be contributing to this disease, is pinkwashing in its most egregious form. We expect better from the largest grassroots breast cancer organization in the world.